Dirt, soil, call it what you want;it's everywhere we go. It is the root of our existence, supporting our feet, our farms, our cities. This fascinating yet disquieting book finds, however, that we are running out of dirt, and it's no laughing matter. An engaging natural and cultural history of soil that sweeps from ancient civilizations to modern times, Dirt: The Erosion of Civilizations explores the compelling idea that we are;and have long been;using up Earth's soil. Once bare of protective vegetation and exposed to wind and rain, cultivated soils erode bit by bit, slowly enough to be ignored in a single lifetime but fast enough over centuries to limit the lifespan of civilizations. A rich mix of history, archaeology and geology, Dirt traces the role of soil use and abuse in the history of Mesopotamia, Ancient Greece, the Roman Empire, China, European colonialism, Central America, and the American push westward. We see how soil has shaped us and we have shaped soil;as society after society has risen, prospered, and plowed through a natural endowment of fertile dirt. David R. Montgomery sees in the recent rise of organic and no-till farming the hope for a new agricultural revolution that might help us avoid the fate of previous civilizations. Global Soil Partnership: Provides information on the Food and Agriculture Organization of the United Nations and the efforts in place to raise the profile of soil across the world. Soil Health Awareness: Sponsored by the US Government, this site provides information for educators. The Book Arts entries will be juried by Lucia Harrison, PhD, Book Artist, Emeritus Faculty The Evergreen State College and founding member of Puget Sound Book Artists; Susan Aurand, MFA, Visual Artist, Emeritus Faculty The Evergreen State College and recipient of Washington State Arts Commission Art in Public Places Commissions; and Abir Biswas, PhD, Earth Scientist and Member of the Faculty at The Evergreen State College. The Poetry entries will be juried by William Kupinse, PhD, Associate Professor and Chair of the English Department at The University of Puget Sound; Sharon A. Sharp, PhD, Poet, Book Artist, Editor, and past-president of the North Carolina Poetry Society, from Boone, North Carolina; and Peggy Burge, MA, MLS, Humanities Librarian at The University of Puget Sound Collins Memorial Library. Exhibition Opening - September 10, 2015 from 5:30 - 8:00 p.m. Reception will be held from 5:30 - 7:00 p.m. Light refreshments will be served. Curator Lucia Harrison will then give a lecture entitled “Intersections: How Artists and Scientists Can Collaborate to Create Environmental Awareness” from 7:00 - 8:00 p.m.
Art/Science Salon - September 17, 2015 from 4:30 - 8:30 p.m.
Tour the exhibit and attend a talk by Lucia Harrison (Visual Arts) and Abir Biswas (Geology) from The Evergreen State College. Educator and Student Night - September 24, 2015 from 4:00 - 7:00 p.m. Learn about “Staying Healthy with Polluted Soils” with Walt Burdsall from the Tacoma Smelter Plume Project and “Combining Art, Literature and Science in the Classroom” with Lucia Harrison. Make acrylic, egg tempera, and watercolor with soil pigments with Curator Lucia Harrison and join members of Puget Sound Greek Life for stories about soil. Dirt? Poets Reflect on Soils and the Environment - October 15, 2015 from 6:30 - 8:00 p.m.
A Poetry Reading with Regional Poets featured in the Dirt? Exhibition. A celebration in conjunction with Tacoma Arts Month. All events are open to the public and will take place in Collins Library. 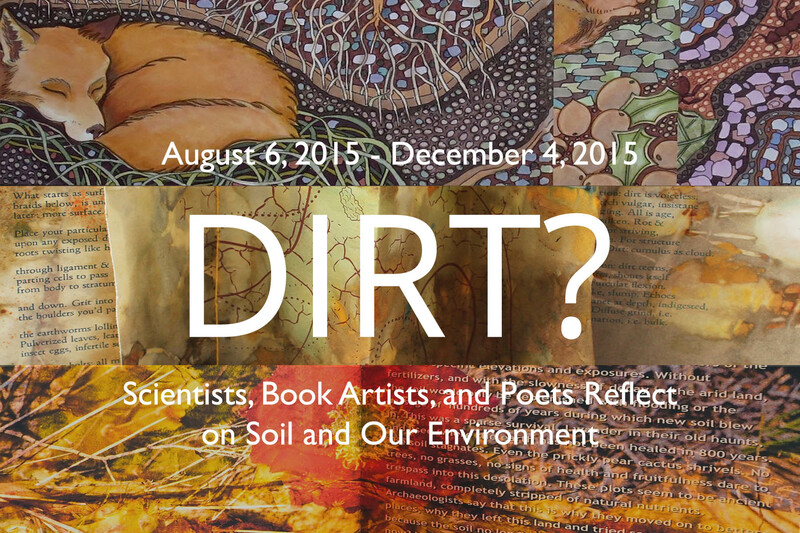 ​ONLINE AND PRINT CATALOGS: View all works in the show and learn more about Dirt at www.pugetsound.edu/dirt. Order the print catalog here. What is soil? What is the difference between soil and dirt? Is dirt what you buy at the garden-supply store or sweep out of your house? Are there other definitions? Scientists say that soil is the Earth’s delicately structured biological skin. Every terrestrial ecosystem and the food you eat sprouts from soil. Soil anchors and feeds forests, prairies, and farmed fields. Soil is habitat for many burrowing animals and harbors an amazing biodiversity of microbes, insects, arthropods, and worms, many yet to be scientifically described. Soil is essential to the water cycle as it filters and gradually releases water year-round to streams, rivers, and lakes. Soil decomposes fallen leaves, feces, dead animals and plants into soil organic matter while recycling the nutrients that plants need to grow. Increasing soil organic matter is one way to sequester atmospheric carbon dioxide and address climate change. Everyone is curious about the life in the soil and the food web, yet we can’t see it. Gardeners love soil and have so many questions about it – how to test it, how to compost, how to enhance soil structure and fertility, how to garden in soils that contain arsenic and lead. Pollution can remain in the soil as former farmlands are developed into subdivisions. Industrial pollution affects those who work and play in the soil, particularly children, gardeners, landscape workers and farmers. Farming practices like using pesticides or improper disposal of animal waste change soil ecology. Logging practices can increase soil erosion into nearby streams blocking salmon runs that bring ocean nutrients back to our soils,. Invasive species, like Scotch Broom in the Pacific Northwest, can change soil chemistry, threatening native prairies. Soil language reflects cultural views of the soil: “dirty little secrets,” “he soiled his pants,” “they are the salt of the earth,” and so on. How does this language vary by culture? Soil is a part of important rituals: we bury our dead in soil – we return to the earth and become part of the soil. The layers of soil can tell the human history of a place. Soil can be considered sacred, land holding the ancestor remains, landmarks linked with stories that pass along cultural values.